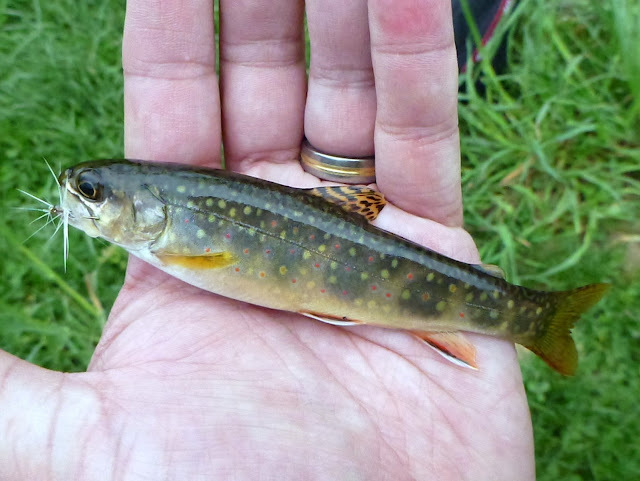 There are no wild brook trout in Southeastern Pennsylvania. OK, I'm sure there's someone out there that will tell me I'm wrong, but it's not that much of an exaggeration. Wild trout, let alone wild brook trout, are pretty scarce in my corner of the state. I don't think the maladies related to (sub)urban sprawl have been kind to the official state fish over the past 250+ years. As such, I've caught quite a few stocked brookies...as well as wild brookies in other parts of the country, but had never caught a wild Pennsylvania brook trout. Crazy, right? So with my weekends in the Keystone State becoming scarce, I thought I'd try to locate the closest wild brook trout stream I could, that also was majority public access. This was not going to be a trespassing mission. After a search on PA Fish & Boat, I headed a bit north of Reading, PA to a tiny spring creek, sight unseen. I'm not going to tell you the name, but if so inclined, it's not too hard to find. It's short and small, but the crystal clear water does indeed come right up out of the ground from a spring and flows down what looks to be a man made, rock-walled drainage ditch that dates from the 1940s. At best, the large majority of the creek is a uniform 6 or 7 feet wide, and the length from the source spring down to the larger lake it feeds is only about 3/4 of a mile. One more notch in your fly rod before you head south. I won't even ask if it was on your Tenkara rod. I know better. A feeder to Valley Creek has them too. Leave them alone & just be happy knowing they are there. That's cool. I have caught brookies in CA and VA but not NC. Still looking for my first one. I could have fished after the brook trout survey. We finished in late afternoone and I had a long drive home. At least I know where they are. There are some feeders to the Schuylkill in Berks County that have wild brookies as well. Please catch and release.